Need to quickly see how your week looks like to see whether you have time for that lunch appointment? 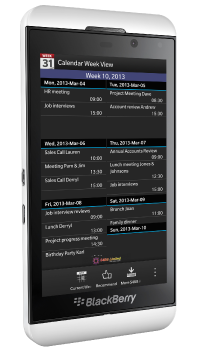 You can now with our all new free Calendar Week View app for BlackBerry® 10. Just tap the app icon and you’ll have an instant overview of all your scheduled appointments and tasks per week. Ideal when your in a hurry! Clean & clear cut interface. Current week shown default, swipe to view upcoming or previous weeks. Calendar Week View is compatible with BlackBerry® 10 and up. Previous Previous post: 2 Billion App Entries Blocked with Lock Apps for BlackBerry!